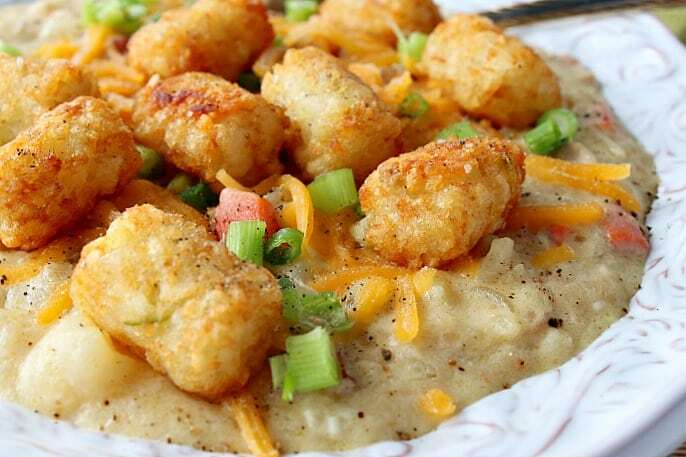 Mashup your potato soup recipe by adding everybody’s favorite…tater tots! Tater Tot Chowder is hearty, delicious, and will soon become a family favorite! I originally came up with this idea for tater tot chowder when looking for a way to use leftover tater tots. The result was this hearty, delicious and comforting gluten-free chowder that I immediately knew I had to revise, rework, and share with you ASAP! 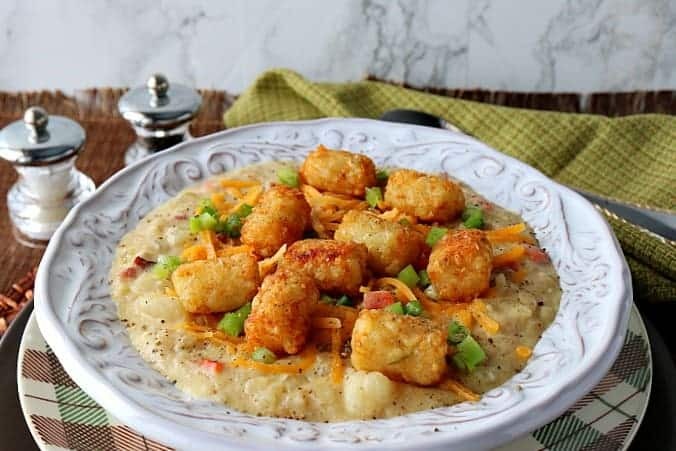 **Please Note – The printable recipe card with detailed instructions, complete ingredient measurements, and nutritional information for making Gluten-Free Tater Tot Chowder is available near the end of this post. 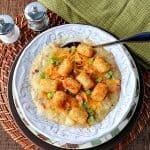 Can leftover mashed potatoes and/or tater tots be used? Yes. You can use leftovers of either of those things. Two or more cups of leftover mashed potatoes are needed, and two or more cups of leftover tater tots. Is there anything I can substitute for the bacon in this potato chowder? Pancetta or diced salt pork will work. Diced pepperoni will also work, but add it in right before serving as there is no need to cook it. You can also leave the bacon out if desired. If you do, saute the vegetables in 2 tablespoons olive oil, or 2 tablespoons butter. Cook tater tots according to package directions. Set aside. Cook 4 medium baking potatoes and allow to cool. Scoop out the center of the baked potatoes, discard the skins, and set the potatoes aside. Dice carrots, celery, and onions. Add the bacon to a large Dutch oven and saute over medium/high heat, stirring occasionally for 5 minutes. Add the diced carrots, celery and onions to the pot. Cook, stirring occasionally for an additional 5-7 minutes. Add the cooked potatoes to the pot. Add the cream cheese and Greek yogurt. Add the cooked tater tots and stir well. Stir in the vegetable stock. Use a potato masher to break up the tater tots and larger baked potato chunks. Simmer over low heat to thicken for 10-15 minutes. Garnish with whole tater tots to finish along with chopped scallions and shredded cheddar cheese. 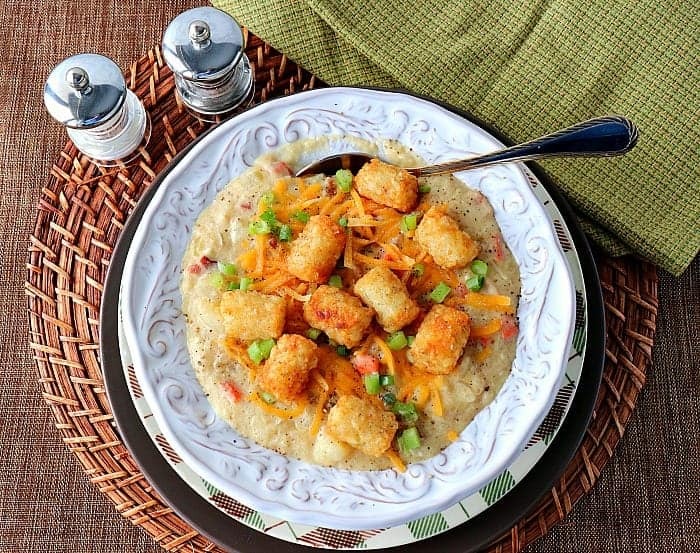 Can gluten-free tater tot chowder be made in advance, and can it be frozen if needed? If needed, make the chowder in advance and store in the refrigerator until ready to reheat (for up to 3 days). Reheat, covered, over medium/low heat until hot, stirring frequently. To freeze leftovers, spoon the chowder into freezer safe containers and store for up to 3 months. Thaw before reheating. 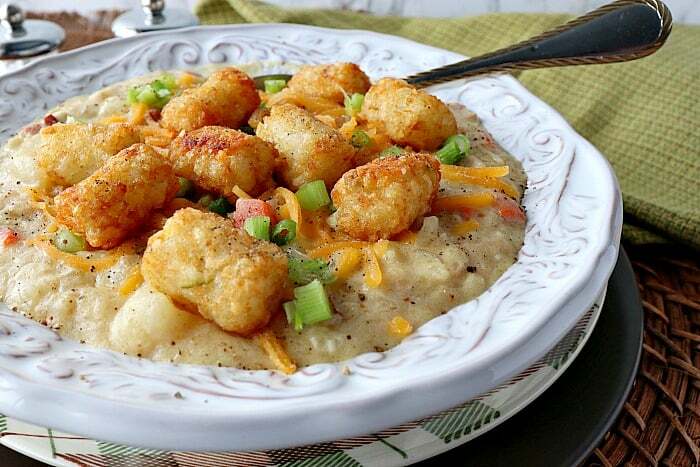 Tater tot chowder is hearty and comforting. It's the perfect thing for a cold winter family dinner. After baking, keep half of the tater tots hot in a low oven. Cook the bacon pieces in a large Dutch oven over medium/high heat for 5 minutes, stirring occasionally. Add the chopped onion, carrot, and celery to the bacon, along with the salt and pepper. Cook for an additional 5-7 minutes, stirring occasionally. Reduce the heat to medium and add the softened cream cheese and Greek yogurt to the pot. Stir well to combine. Add half of the cooked tater tots and all of the baked potato to the pot along with the vegetable stock. Bring the chowder to a simmer and cook, uncovered, for 10-15 minutes to thicken. *Note - if the chowder is too thick for your liking, add a touch of water to the pot and cook accordingly. If desired, use a potato masher to mash some of the tater tots and baked potato into smaller (but still chunky) pieces. 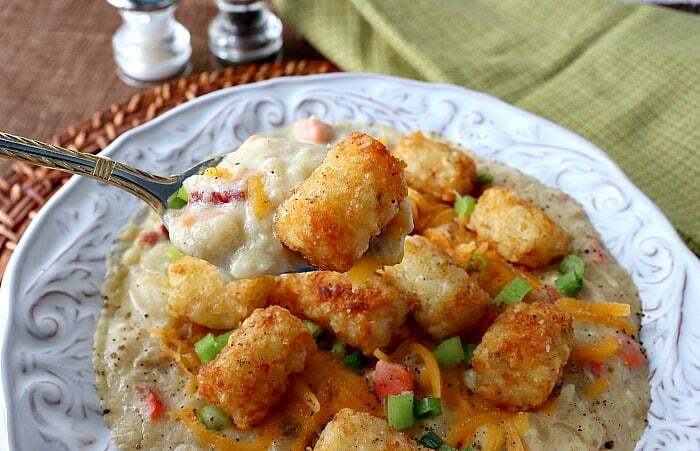 Spoon the chowder into bowls and garnish the remaining whole tater tots, green onion, and shredded cheddar cheese. I sincerely hope you’ve enjoyed today’s family-friendly gluten-free tater tot chowder recipe as much as I’ve enjoyed bringing it to you! You had me at tater tot! I mean, could there be a more delicious chowder recipe?? Glad you approve, Tayler! Thanks so much! Never thought of combiningtatertors with chowder, look great and feel so comforting! It’s a riff on potato soup. Thanks, Brandi!